If you’re looking for a quick, presto mid-week supper, it doesn’t get faster cooking-wise than mussels. Apart from the debearding and cleaning of the mussels that can take a wee bit of time, this dish is dead easy to make and everything else from prepping to serving should take no longer than 30 minutes. A spin on the classic Spaghetti Vongole recipe (is it just me or are fresh clams horribly difficult to find anyway!? ), the depth of flavour from the mussel-ly-white-wine cooking liquor is a more than able substitute and perfect with the background heat of the chillies and sweetness of the scallops, fresh tomatoes and broccoli. We used Squid Ink Pasta instead of normal Spaghetti (as it was the only pasta we had left in the store cupboard). However, the juxtaposing colours and added richness of the Nero di Seppia actually gave the dish far more ooomph if you ask me. Pre-heat a large stockpot on a medium to high heat and throw in the mussels and white wine, letting the alcohol from the wine boil off for about 30 seconds before putting the lid on. Cook for no more than 2-3 minutes until all the shells of the mussels open. Drain the Mussels in a colander, remembering to reserve the white-wine-mussel cooking liquor in a bowl which will form the base of the pasta sauce later. De-shell all the mussels and keep aside. In the same stockpot the mussels were cooked in (to save on washing up), get the pasta cooking in boiling, salted water per the pack instructions. During the last 4-5 minutes of cooking time for the pasta, add the broccoli to cook with the pasta. Remember to drain immediately when cooked so the pasta and broccoli remain al dente. While the pasta and broccoli cook away, in a separate pan, sautee up the chopped garlic, shallots and chilli in olive oil on a medium heat for 30 seconds, then add the Scallops, pan-frying for 1-2 minutes on each side until the surface of the scallop caramelizes and browns. Add the chopped tomatoes, cooking for a further 2-3 minutes until the tomatoes soften. Turn up the heat to high and combine the cooking liquor, cooked spaghetti and broccoli with the scallops, tomatoes, garlic and chilli. Add the knob of butter to thicken the sauce and give it some shine and toss / mix thoroughly for a minute or 2 on the heat. Season with freshly ground black pepper and serve immediately (no need for additional salt at this point unless you feel its required – the mussel liquor is usually quite salty enough to season the entire dish). The colors just jump off the page! I would love to try this. 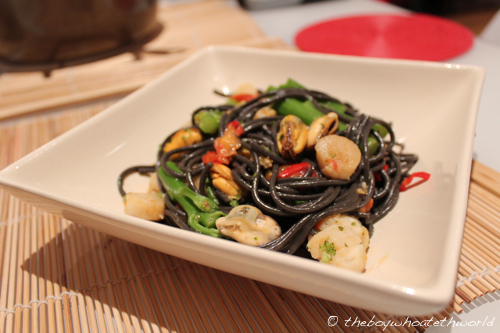 @Savory Simple: The justaposing colours really made the dish for us (was a bit of fluke though as we really intended on cooking normal spag, but all we could find was some old squid ink pasta we had bought from our travels in italy a couple years back!). Thanks for stopping by and subscribing – love the photography and reciples on savourysimple.net btw! @Stephan: Not all that hard to make at all – give it a try! Was good catching up last night.